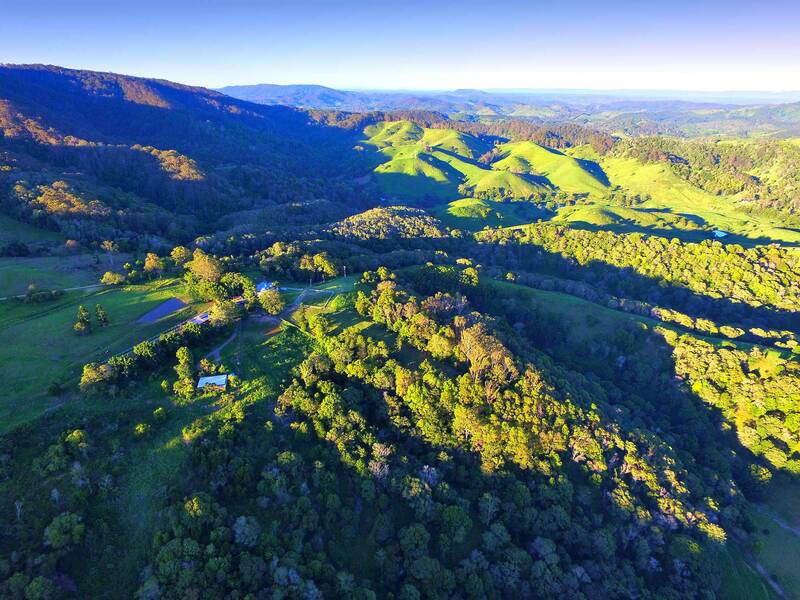 Rosecliffe Boutique Farm Cottages is a unique and beautiful Noosa Hinterland Accommodation getaway, set on 93 acre Land for Wildlife and Registered Conservation property perched high above the rolling green hills of Pinbarren Valley. Rosecliffe is surrounded by nature and has sweeping views of the rolling green hills of the coastal hinterland extending out to the coral sea. Here there is little night time light pollution and the array of stars visible at night will dazzle you. The Woondum National Park Wilderness Area and The Noosa Trails Network system boarders Rosecliffe Boutique Farm Cottages and connects with over 300 km of purpose built trails wonderful for walks, nature watching, mountain biking and hikes. The sentinel mountain of Mount Pinbarren National Park dominates the view and wildlife abounds including wallabies, squirrel gliders, paddy melons, echidnas, platypus in Pinbarren Creek, koalas visiting from Woondum Nattional Park, wedge tailed eagles and over 80 species of rainforest birds including black cockatoos and king parrots. We feed the wild birds daily and get an array of rain forest species visiting our feeders. We provide you with Noosa Trail Network Map and a flashlight is provided for nature spotting a night. Rosecliffe Boutique Farm Cottages has an infinity waterfall pool perched on the hill side with spectacular views extending from Double Island Point to Noosa looking out across the rolling hinterland hills to the coral sea. It is blue lit at night when you can take in the stars and distant hinterland lights. Under the lit water fall there is seating for lounging and a picnic table for sunset drinks or watch the sunrise over the sea with pink mist floating below the hills. At Rosecliffe Boutique Cottages Noosa Farmstay we breed Belted Galloway Cattle (our pandas! ) and keep horses, alpacas, a llama, miniature ponies and chickens. We invite you and your children to join the daily feeding of the of the friendly animals and to collect and sample the fresh organic farm eggs from the hen house. We have an organic orchard where you can pick and take the seasonal fruit to use during your stay. A juicer is provided in your cottage so that you can make fresh juices. Enjoy the extensive tropical gardens, swing under an age old ficus tree, take in the panoramic views, be surrounded by native wildlife and farm animals, listen to the sounds of nature. Rosecliffe Boutique Farm Cottages offer Noosa Pet Friendly Accommodation. We invite you to bring your family doggy member. Enjoy taking your dog on the many walks on farm and on the Noosa Trail Network or seasonally swim in our deep clean dam. Please check information on accommodation pages for each cottage is bespoke and has different in house doggy ammenities. The Noosa Hinterland is the gateway to some of Queensland’s most exotic and pristine natural beauty. 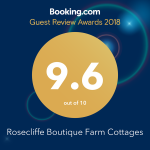 Rosecliffe Boutique Farm Cottages is ideally located with close proximity to beaches, Noosa Hinterland country villages and national parks with a huge range of outdoor activities such bush walking, bird watching, mountain biking, sightseeing, canoeing. The turquoise waters and long white sand beaches of the Coral Sea, the coloured sand cliffs of the Noosa North Shore and Rainbow Beach, Woondum National Park, Cooloola National Park are at your door step. Rosecliffe Boutique Farm Cottages is 15 minutes to the Noosa Hinterland villages of Pomona and Cooran for restaurants, cafes, specialty shops, antique stores and weekend markets and only 40 minutes to Noosa with its famous beaches and restaurants. Want to know what happens on a farm stay? We stayed in the Noosa Hinterland at Rosecliffe Boutique Farm Cottages. Our little guy had a great weekend meeting and feeding the chickens, horses, cows, miniature ponies, llamas and dogs. Our Labradoodle joined in the fun as well. So good to get out into the country (as well as see the beach) for the weekend from Brisbane!